There are more and faster developments in the DNA world than ever before, these days. It seems like hardly a day goes by — and certainly never a week that goes by — without some new tool or concept or both being available to help with figuring out how to use DNA to advance our genealogical research. Louis Kessler, a Canadian genealogist and programmer, has a new tool for use with autosomal DNA result from Family Tree DNA’s Family Finder test. Called the Double Match Triangulator (DMT), it combines two different people’s Chromosome Browser Results (CBR) files to provide Double Match and Triangulation data that can be used to help determine genealogical relationships. This is an autosomal tool that allows the genetic genealogist to look at their autosomal data in a slightly different way than other methods. 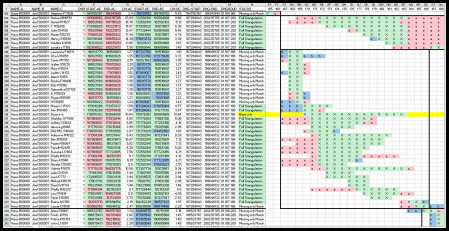 It assists by finding every segment from every matching person that double matches and additionally those segments that triangulate with two specific people, and produces an Excel file that contains a Map page containing all the matching segments and a People page listing all the people who match. Right now, it’s for Windows only — no Mac version, it’s got a fairly robust help function — and it’s not for beginners. We all need to spend some time making sure we understand what exactly a double match is, what a triangulated match is — and how to use them in our genealogical research. For the intermediate to advanced researcher who’s tested on Family Tree DNA, however, it’s a lovely piece of work. Read more about it at the Double Match Triangulator — and then give it a try! There are new tools available at Gedmatch as well, in the Tier 1 utilities. Now… though Gedmatch.com is a free site, the Tier 1 utilities aren’t free: you get one month worth of Tier 1 access for every $10 contributed to the site. Loads of information can be gleaned after you upload your raw data to Gedmatch using the free utilities — but there’s a lot more that you can get if you’re willing to pony up. The Tier 1 utilities, for example, are where you’ll find the Lazarus tool — a tool that can be used to try to reconstruct the general genome of an unavailable individual (say, a parent or a grandparent who has passed on) by combining data from that individual’s closest relatives and descendants. And it’s in these Tier 1 utilities that you’ll find the new Triangulation Groups tool: a new tool that reviews your 300 closest matches in the Gedmatch database to try to construct and visually depict triangulated groups. It takes 10-15 minutes, depending on how busy the system is, and reports back those who appear to share segments in triangulated groups. This again isn’t a new researcher tool. To understand segment triangulation better, you might want to read up on Jim Bartlett’s blog, Segmentology, and particularly his How to Triangulate instructions. Once more, this tool goes into the advanced category… but it can be fun to play with if you have enough family members who’ve tested. If you’re just getting started or want to get more family members tested, there will never be a better time than right now. The Legal Genealogist has already reported on the sale going on at Family Tree DNA — $59 for the autosomal Family Finder test is the lowest it’s ever been. Right now, AncestryDNA is also on sale — the Thanksgiving sale only lasts until 11:59 p.m. tomorrow, Monday, November 28th, so if you’re thinking about AncestryDNA, this is a good time to go ahead and pull the testing trigger. The sale price at AncestryDNA is $69 in the United States, and there are savings in Canada ($50 off), Australia ($99) and the United Kingdom (£30 discount) as well. Prices for these autosomal tests are as low as we’ve seen, so if you’ve been on the fence, now’s the time to climb on down and get going. Just today I have purchased my first dna tests with FTDNA, the Family Finder. I got more than one, hoping that my older relatives will be in a good mood for Christmas… I just couldn’t pass a 59$ price! Good luck getting everyone to test!! One grandmother has said yes already, I just hope she doesn’t change her mind! Now, for the other grandmother and great uncles it’ll be more of a challenge. Meanwhile I’m learning all I can about it, webinars and articles and so on. Thank you! Judy, I used the new Gedmatch triangulation tool, and found a good match with my paternal aunt, my brother and myself on several chromosomes, over 15cM, thousands of SNPs, yet when I do a one-to-one on this person with my brother or myself, there is no match. She matches my aunt on about 600cM. How can this be? Not sure — the tool is in beta so make sure you give feedback on this problem. The DMT tool can be used for GEDmatch results as well. Users just have to make sure the data and file names are in the same format. My 82 year old mother is eager to be tested and I am seeking guidance on the best test for her. Based on her known family history she believes she is 100% German. Her Great Grandparents births are each traced back to the 1850’s-60’s in South Russia (Volga) with migration to the US around 1885. We have very little information beyond these Great Grandparents and would be thrilled to give her more information about her German or possibly Russian roots. The problem is that while DNA is truly excellent at the continental level (Europe versus Africa versus Asia), it’s not very good at all for distinguishing populations below that level (say, English versus French versus German). What it may do, however, is help your mother locate cousins — even distant cousins — who may know more about her roots while giving her some general background. So I’d say go ahead and start with AncestryDNA or with Family Finder from Family Tree DNA. Thank you for the feedback! Our adventure begins! (1) Triangulation: Identify and confirm triangulation groups (TG) from your matches. It appears to be largely in the way the data is presented. I’m hoping to get more clarification from Curt or John.